I am a recent acolyte to the Wim Hof Method (WHM), and I’d like to stress that I am not an expert. However, within a very short period of time have been applying it successfully in improving my mood, energy levels and recovery time following cold swims. If you are a serious cold water swimmer, I believe that you can really benefit from the WHM. The man Wim Hof, came out of the Netherlands, traveled east while immersing himself in yoga and self-discovery and eventually came to be happily married. The tragic death of his beloved wife drove him to forge a method of breathing and cold therapy from his subsequent grief, pain and depression. Using this method he undertook several amazing feats of cold survival and performance. These include climbing Mount Kilimanjaro in shorts, running a half marathon above the Arctic Circle on his bare feet, and standing in a container while covered with ice cubes for more than 112 minutes. The outstanding thing about this man is that he does not claim to be special, only that he has tapped into a method that we can all access, without spending a lifetime in the mountains practicing some esoteric training regime. The three pillars of the Wim Hof Method are: Breathing, Cold Therapy and Commitment. Because we are regular winter swimmers, we have already got the cold therapy element covered so we are one third of the way there. I have found it very easy to commit the time to learn the simple breathing practices and apply it to my cold water swimming. Immediate benefits include much faster recovery following cold swims, a general feeling of well-being and intense increases in my body temperature following certain breathing exercises – I haven’t been able to apply this to my swimming as yet but I find it encouraging. Feedback and experiences shared with our Cold Water Swimming Workshop clients reflect my personal findings. The WHM works. We can swim safer and recover faster using Wims simple method. I would urge all swimmers interested in getting more out of their cold water swimming to join us on our next workshop and explore the WHM for themselves. We have our very own Wim Hof expert here in Cumbria. Emma Corrie is one of the highest qualified Wim Hof instructors in the world and she runs the Wim sessions during our workshop. She can be contacted via the link below. There are many excellent YouTube clips covering Wim’s feats of cold endurance as well as a free introductory lesson available on his website (links below). 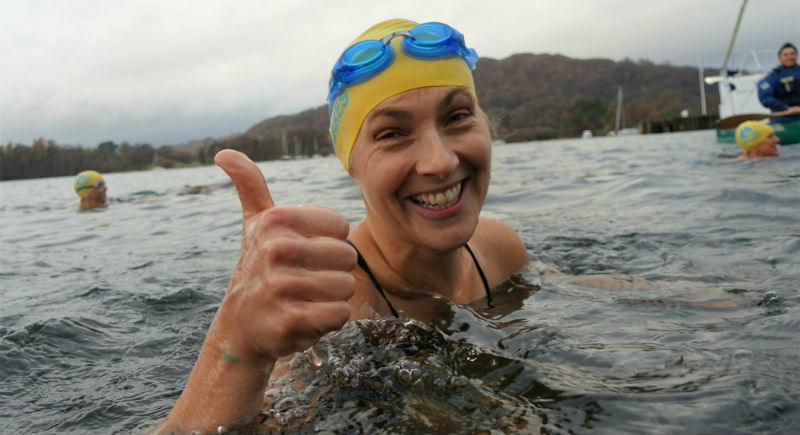 Look out for more Swim the Lakes articles about the Wim Hof Method and swimming as we progress with our own applications of the method to cold swimming. Happy swimming, and remember… just breath!